Something very significant is happening in the publishing world, and it may be the best thing that has ever happened to authors–especially those who choose to self-publish rather than run the rat race that is traditional publishing. In the 18 months between February 2014 and September 2015, the Association of American Publishers (AAP), whose 1200 members include the “Big Five:” Penguin Random House, HarperCollins, Simon & Schuster, Macmillan, and Hachette — have seen their collective share of the US e-book market collapse. Meanwhile, during that same period, Amazon’s overall e-book sales have continued to grow in both unit and dollar terms, fueled by a steady shift in consumer e-book purchasing behavior away from traditionally published e-books and toward indie-published– and Amazon-imprint-published e-books. These “non-traditionally-published” books now make up nearly 60% of all Kindle e-books purchased in the US, and take in 40% of all consumer dollars spent on those e-books. This is not only a sea change in the way books are published, it is a major departure from the way authors are marketing their work. Traditionally, authors have used agents to sell their work. I have. The agent then had to peddle the writer’s work to various publishing houses, get a contract, wrangle an advance (if the book wasn’t finished) and then turn over the work to the publisher who made (often arbitrary) decisions about the content and style, how it was structured, about the cover, and ultimately how it was marketed. The author then was paid a royalty based on sales, after deductions for the advance and whatever other “fees” were built into the contract. Once authors finished their work and turned it over to a traditional publisher, their role became one of passive observer. There might be a few interviews, perhaps a book review or two, but all the author could do is sit back and hope the book became a best seller. (A bit like hoping to win the lottery). But more and more authors, many of them successful, have opted for the so-called “indie” publishing route. By doing that, they have control over not only the writing, content and style but also the way the book looks and how it is marketed. 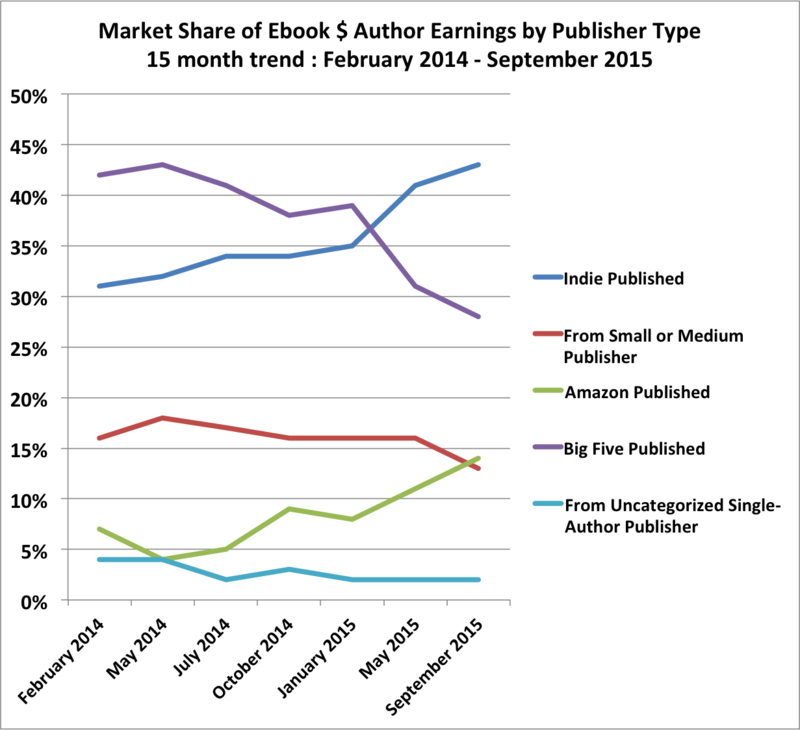 The data collected by AAP and further analyzed by Author Earnings, a website by authors and for authors (http://authorearnings.com/), confirms this shift in the American publishing world. “Nontraditionally-published” e-books from indie self-publishers and Amazon publishing imprints make up 58% of all Kindle e-books purchased in the US. Traditionally-published e-books make up 42% of Kindle e-books bought in the US. When the AAP reports “declining e-book sales,” they are describing the modest portion of the US e-book market held by their 1200 participating traditional publishers, whose share of the broader US e-book market has fallen in the last 18 months from 46% of all Kindle e-book purchases to less than 32%. E-book sales for big publishers may be declining, but they are being replaced by indie sales at lower prices at Amazon. When Author Earnings began analyzing Kindle sales in February 2014, traditionally published authors were taking home nearly 60% of the e-book royalties earned in the largest bookstore in the world. 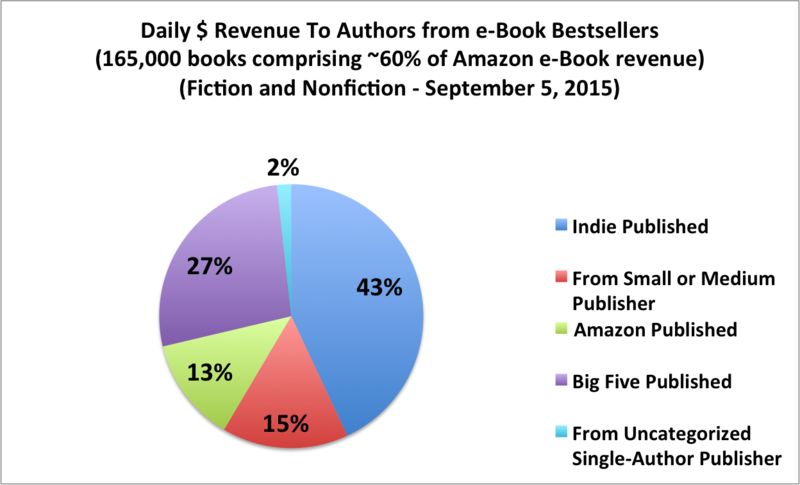 Today, traditionally published authors are barely earning 40% of all Kindle e-book royalties paid, while self-published indie authors and those issued by Amazon’s imprints are taking home almost 60%. 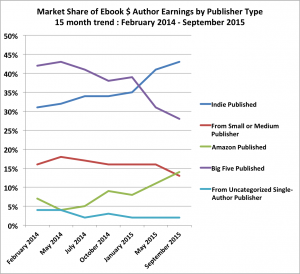 From an author-earnings perspective, in 18 short months, the US e-book market has flipped upside down. But the change in publishing is not limited to the e-book market. Last month, a self-published indie PRINT children’s book — a trade paperback — was one of the Top five print bestsellers in the US for two weeks, selling more than 29,000 print copies in its first week and hitting #6 on USA Today’s combined Best Seller List. But the exciting news for indie print books does not end there. Wal-Mart will soon be carrying a self-published book on its store shelves: Jamie McGuire’s Beautiful Redemption. Both pieces of news disprove the outdated notion that a traditional publishing contract is necessary if an author wants to achieve chart-topping PRINT sales, or to see their print book sold on Wal-Mart shelves. Old print distribution barriers are starting to crumble, just as they already have for digital. We are rapidly moving into a brave new world of publishing. It is one that benefits not only the writer, but also the reader who now pays a lot less for that writer’s work. The difference is that even though a reader may be paying just $4 for that e-book or $15 for that soft cover, $3 of that $4 or $12 of that $15 is now going directly to the author and not to an agent or to a publisher. 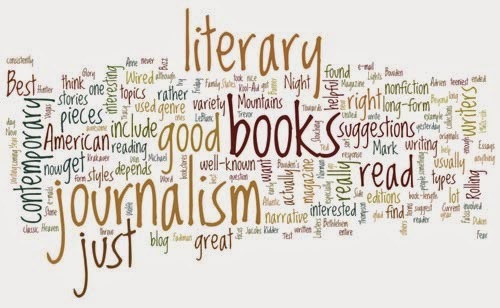 It is a win-win for both the author and the reader–a bona fide anomaly in the cutthroat world of book publishing.